← PM Modi’s Interview with Time Magazine. . . . . I will imagine that Mr. Modi will be severely criticized for this position. The largest polluters in the world are China and India. It will be interesting to see how he walks the tightrope between the international goals for climate issues and the need for jobs and economic success in India for his people. 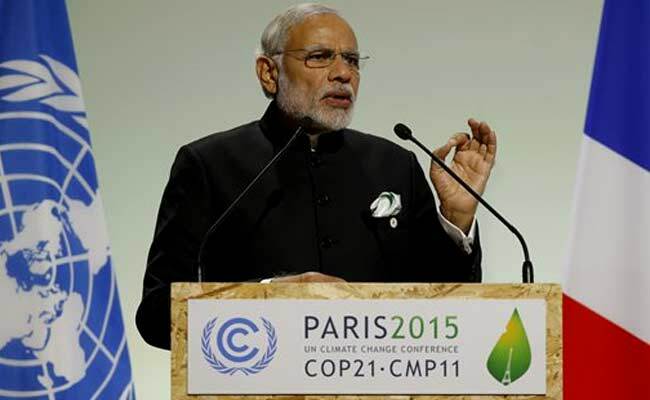 Prime Minister Narendra Modi told the global climate summit that advanced nations, which have a larger carbon footprint, should take the lead in addressing the climate change issue. Democratic India, he said, “needs to grow”. The 21st session of the Conference of Parties or COP21 in Paris aims to forge an elusive agreement to curb global warming by limiting the emission of greenhouse gases. “It is not just question of historical responsibility… We hope advanced nations will assume ambitious targets and pursue them as they have the most room for impact,” PM Modi said in his address at the summit. PM Modi also joined the leaders of 19 other countries including the US and China for “Mission Innovation“, under which, the governments are committed to double public investment in basic energy research over the next five years. “We have to ensure in spirit of climate justice that the lives of a few do not cloud opportunities for those on initial steps of development ladder,” PM Modi said at the inauguration. 28 of the world’s wealthiest investors like Bill Gates and Mark Zuckerberg of the US, Jack Ma of China and India’s Mukesh Ambani joined the energy coalition to pool money for the initiative. India, he said, wants to make conventional energy like coal cleaner. But there are also plans to convert “40% of our installed capacity to non-fossil fuels,” he said. PM Modi had a bilateral meeting with US President Barack Obama on the sidelines of the summit. He also shook hands and talked with his Pakistani counterpart Nawaz Sharif for a few minutes, as the summit started. 183 nations have submitted national action plans, but they are not enough to achieve a goal of limiting global warming to two degrees Celsius. This is the threshold at which scientists say the worst impacts of global warming will be inevitable. I would love to hear your thoughts and or comments. This entry was posted in India, Travel, Uncategorized and tagged Climate control issues, Economics, economy, International community, Mr. Modi, Prime Minister of India. Bookmark the permalink.